A travel feature photography assignment for Qantas Airways’ Travel Insider inflight magazine, written by Ann Fullerton. The trip was part of a wider tour run by travel company World Expeditions. 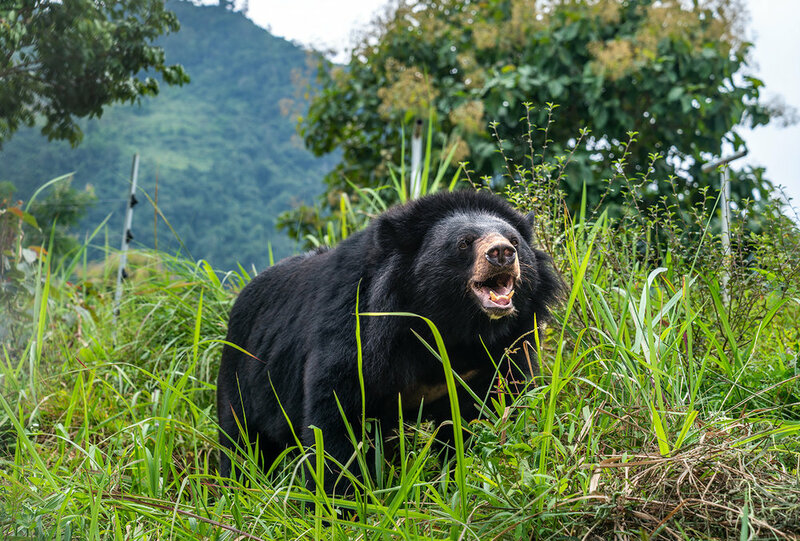 Below are some tear sheets from the article plus other shots from the Free the Bears sanctuaries located at Phnom Tamao Wildlife Rescue Center, Cambodia, and Luang Prabang, Laos. As well as a short side trip to Mandalao elephant sanctuary in Luang Prabang. A six day road trip through the Mekong Delta by scooter. From Saigon to Phnom Penh via Ben Tre, Vinh Long, Sa Dec, Chau Doc and Ha Tien. Great weather, good street food, lots of boats and friendly folk. Below a handful of travel snaps from the trip shot with the Sony A7Rii, Zeiss 24-70 f4 lens and Canon 16-35 f2.8 L Mkii on a Metabones adapter. Finally was able to properly use the Sony Alpha 7Rii for a personal travel photography project in Chhlong Cambodia. An amazing high image quality 42mp full frame camera, the small size is perfect for use in travel and documentary photography, but also high end enough for commercial and studio use. Soon HDR processing will be history as new sensors' dynamic range will become greater. I felt liberated with this small and robust camera after being used to carting a hefty Canon DSLR around. Less obtrusive for both portrait and general travel photography. The Sony menu system will take some getting used to, none intuitive and disorganized. Minimal weather sealing could also be an issue, the camera is now covered in Cambodian countryside dust and may need a professional clean. In 2003 I took my first ever motorbike road trip adventure from Phnom Penh to Sen Monorom in Mundullkiri province over 10 days or so, with a 35mm analogue film SLR and a few rolls of Kodak Portra. On arrival in Snool I was covered in thick orange dust, few roads were sealed at the time. On the return journey we stumbled upon Chhlong village on the river road from Kratie to Kompong Cham. 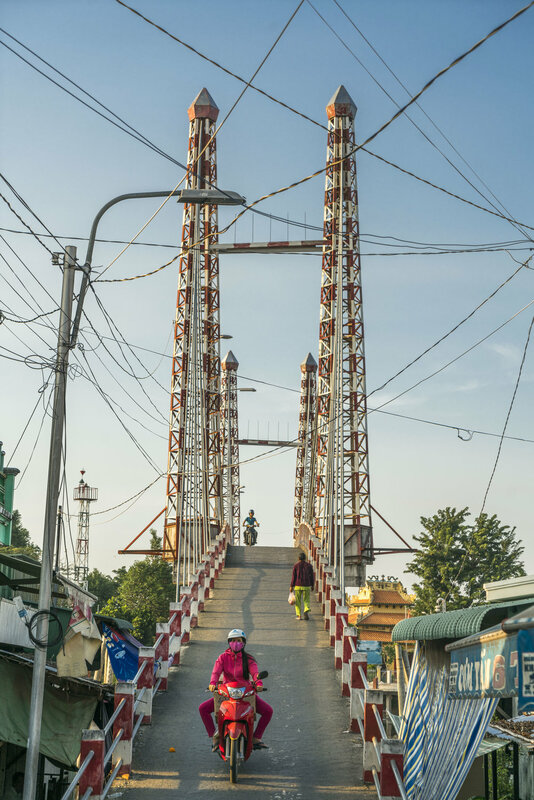 A small town on the banks of the Mekong in Kratie province, dilapidated French colonial buildings, a bustling market and the simple quiet life along the river was a real draw that had a lasting impression. We ended up staying for 2 nights in the town's only guest house. Returning in 2017 with a Bangkok photographer friend was an attempt to get away from the expats and tourists of Phnom Penh, and even Kampot my usual go to place when in need of a break. To feel once again the only foreigners around in a sedate land. Kratie city is just 4 hours from Phnom penh by share taxi and Chhlong 1.5 hours from Kratie on a motobike. For our 2 day jaunt we rented Honda Wave's in Kratie city early morning. We skipped Kratie town altogether, the town's folk were miserable in 2003 and not much seemed to have changed 14 years later, something I haven't really experienced in other Cambodian towns. Once out of Kratie town, things changed rapidly into the old dreamscape I remember and still try to hold onto after 14 years in Cambodia. Conclusion. The real Cambodia still exists out there in all directions, it's further from Phnom Penh than it used to be. Take it while you can. More images from Chhlong can be seen in the Chhlong gallery here. I recently revisited the privately owned Teuk Chhou Zoo in Kampot for the first time in about a year and a half. To my dismay I found many of the animals I had photographed in 2013 missing with empty enclosures. Namely the female leopard, two Bengal tigers, two Asian golden cats and a female gibbon and her infant, leaving her male mate alone where once together they lived a seemingly happy existence. The male gibbon still enjoys his head being massaged through the fence. Other remaining animals looked unhealthy. Large birds of prey still in cages way too small for them with no shade from the baking heat, some with what looked like broken wings. I also noticed three new sun bears in the old orang-utan cage. A black bear in the tiger's enclosure and what looked like a different wild boar than the previous one I had photographed who foamed at the mouth. Some people when asked informed me that the missing animals were moved to Prey Veng zoo, also owned by Nihm Vanda. I haven't been to Prey Veng zoo, but in a Google search the first results are "Zoo of Death" with petitions to "Close down Prey Veng Zoo"
Since the breakup between the zoo owner His Excellency Senator Nihm Vanda and NGO Footprints in 2013, the animals were in need of help yet again. 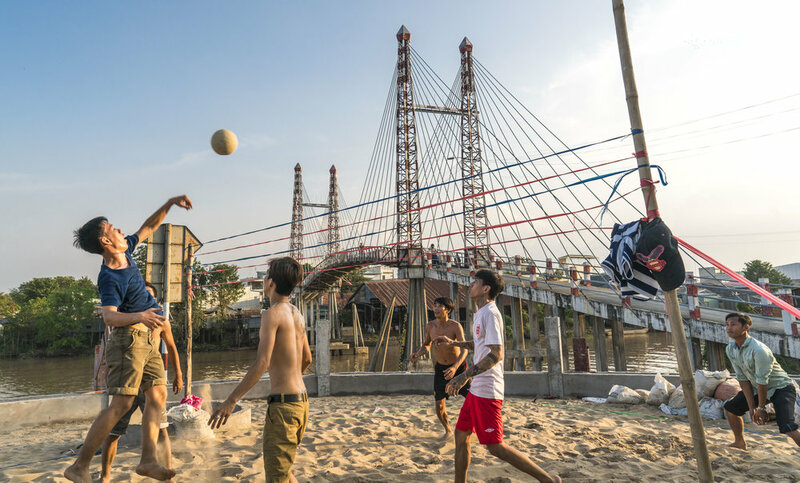 Visible substantial improvements could be seen during Footprints short time at Teuk Chhou and positive stories were published in national newspapers and magazines such as the Phnom Penh Post and Asia Life. With titles in the realms of "Zoo on the rise" "Zoo back on track" Apart from the initial breakup these stories haven't been followed up since. Are these animals dead? Have they been trafficked? Or have they been eaten, as the owner once stated if he couldn't get money. Or are the two zoo's being refurbished/cleaned/rearranged? If the animals are dying why introduce new animals? What is going on? It seems both zoos should be closed down. Frequented by the French colonialists and Cambodian elite, Bokor Hill was abandoned first by the French in the late 1940s during the first Indochina war, then again in 1972 by Cambodians as Khmer Rouge seized the area. 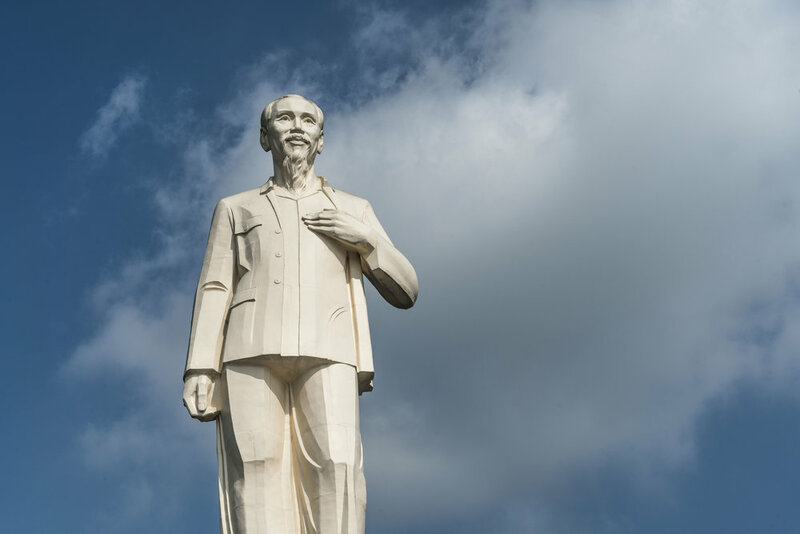 During the Vietnamese invasion in 1979, Khmer Rouge entrenched themselves on the mountain and held on tightly for months. Up until the early 90s the area was still a no go area, land mines, poachers and bandits still being a danger. 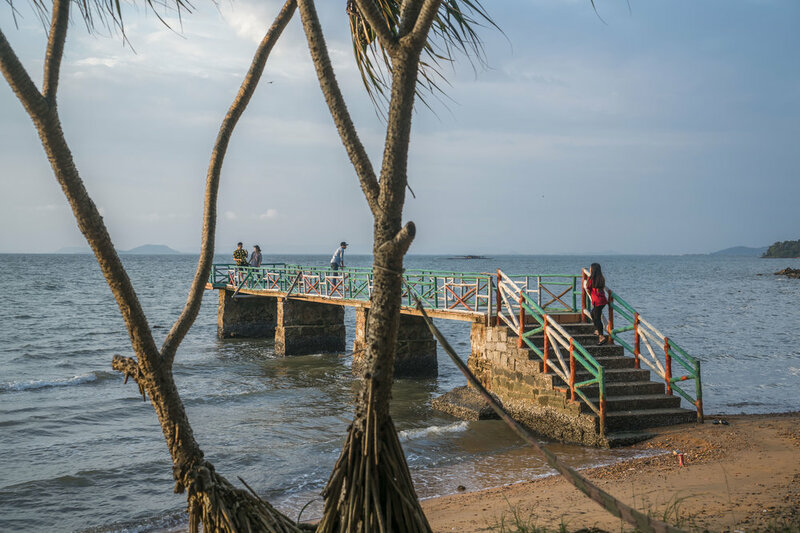 Today the allure of "wild" Bokor and its ecotourism potential is rapidly disappearing, clearing swathes of nature to be replaced by tasteless casino resort buildings, concrete parking lots, housing estates, golf courses, fast food restaurants and artificial playgrounds. Plans are underway for a complete "City in the Clouds" overhaul. A new road was completed in early 2012 that was once a 32km bone jarring motorbike ride through the jungle. Now the best quality road in the country can be driven in less than an hour, wide enough to accommodate gambling bus tours from neighbouring Vietnam. The once centre piece French colonial era Grand Palace Hotel still stands overlooking Kampot bay and the surrounding hills of Bokor national park. But sadly many of the old buildings are being demolished. The site is owned by the government but is under a 99 year lease to the richest man in Cambodia, Mr Sok Kong (Sokimex Sokha company). Sokha’s plans to redevelop the plateaus is said to be completed in 13 years.